Welcome to my monthly 'Free Pattern Friday' feature, where I road test a free sewing pattern or tutorial: sometimes a children's one, sometimes a women's one. I publish these posts every first Friday of the month, timed to provide inspiration for those who plan to get their sew on over the weekend. I firmly believe that, if you pick your projects carefully, sewing doesn't have to be a crazy-expensive way to clothe yourself and your family. Thanks to all the amazing pattern designers who have offered up their hard work for us to enjoy for free. I usually try to alternate between adults' and kids' patterns for my Free Pattern Friday posts, however, it didn't quite work out this month and today I'm back with another kids' pattern. However, this kids' pattern is an absolute blinder, and if there are any kids in your life of any age that you feel like sewing for, you're going to want to know about the Misusu Patterns Rowan Tee pattern. Massive thanks to Elles, the designer behind Misusu Patterns, for sharing her hard work for free. The Rowan tee is an over-sized, boxy, unisex-style T-shirt with two sleeve variations and optional patch pocket that is designed for knit fabrics. The pattern consists of the following: front piece, back piece, long sleeve piece (the short-sleeved version is a grown-on/kimono kind of deal), pocket piece and two neckband pieces, depending on if you are using jersey or rib for the neck band as rib knit (AKA ribbing) is stretchier. The PDF includes a layers function so you can isolate the size you require and save ink when you're printing it out. Check this out: the Rowan tee is graded from approx. 0-3 months to 13-14 years old! It's very rare to find free sewing patterns that go beyond young-child sizes. That makes this a VERY useful pattern, in my book. The pattern recommends that you use the child's measurements when picking a size, rather than going by the age, and I would definitely second that. I measured my (average sized) kids and found they both came at least one size smaller than their age range, plus both finished garments have come out very roomy. The thorough instructions include details on how to combine and blend between sizes and how to lengthen or shorten if necessary, if the child you are sewing for spans more than one size range. This knit top pattern calls for light to medium weight jersey with some lycra/elastane/spandex content so that it has at least 25% stretch. As mentioned before, jersey or rib knits can be used for the neckband, and you could make the pocket from woven fabric if you prefer. I used a medium weight knit for Dolores's stripy short-sleeved top, and for the stripy pocket version (made as a birthday present for one of her friends) pictured above. The red stripes are printed on to this fabric, so it has a certain stiffness that keeps the shape of the finished garment well. Frankie's version is made from a mash-up of different striped jerseys from my straps bin. Most of them are lighter weight jersey with a lot of drape, which has resulted in a floppier, drapier garment. Thoughts of a garment made from a combination of different stripes have been floating around my brain for ages, and I'm so pleased with how it has turned out. The anchor print jersey that I used for the pocket was from Girl Charlee UK, left over from this Bronte top. A number of people have asked me if I've found that free sewing patterns tend to be poorer quality, or not as detailed, as patterns that are for sale. Most designers who release free sewing patterns do so to showcase what potential customers can expect from the rest of their range. So although I would say that most free sewing patterns tend to be more simple in style with fewer design details, the patterns files and instruction content are almost always exactly as you'd find from the rest of a designer's output. The Rowan tee pattern, IMO, is a prime example of this. Not only have Misusu Patterns bothered to grade it out to such a large size range AND include the layers function, but the instructions are fantastic. Included are useful tips for sewers who may be new to sewing with knits or new to making simple pattern adjustments (combining sizes and changing the length), and each construction step is very clearly explained and illustrated. For experienced sewers, this is a pleasingly quick make that allows you to create a garment with a nice, clean finish. It's so quick (the short-sleeved version in particular, of course), that you could easily whip up a couple in a few hours if you find your child's wardrobe is suddenly a bit sparse after they've had a growth spurt. As I mentioned before, free sewing patterns in larger kids sizes are rare, as are unisex styles or those more suitable for boys. TBH, I don't feel entirely comfortable with that last sentence, as I firmly believe that kids shouldn't be made to think that anything is specifically, and only, for boys or girl's, and that they should feel free and supported to wear whatever they want. But you know what I mean. But in short, yes, I fully intend to use this pattern again. 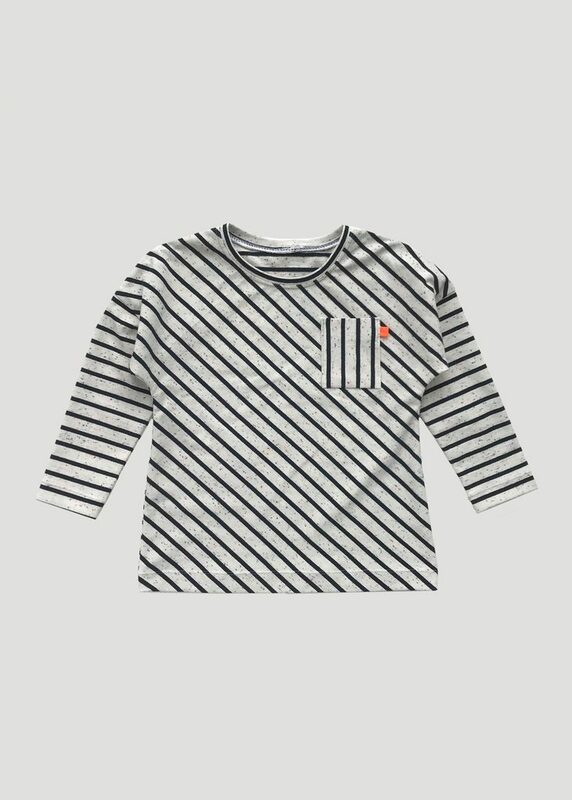 The roomy, over-sized shape is a bit annoying for layering under cardigans and jumpers, but it gives so much freedom of movement which I feel is essential for kids at play. I love the version made from different striped knits. These look fab! Thank you for reviewing this pattern. I've got older boys and one of them loves to sew so this would be a great project for us to make together and it would be a useful alternative to his usual soft toy/cushion/puppet projects! @ Mrs C, I totally knew what you meant! @ Bec, that makes me so happy to think of you and your son sewing him T-shirts together!